For three decades the success and value of How To Be A Working Actor is an indication of the help and honest advice that the book has resonated with actors in all stages of their development. When a casting executive and a working actress met for lunch in 1985 to discuss the possibility of a book that would answer the same old questions about how to get a job, research began to make it a reality. We discovered that there was no book in the marketplace that addressed how to get started, difference between job-seeking in New York and Los Angeles, the promotional package which included pictures, resumes, cover letter, business cards, postcards and demo reels, impression management and getting your act together with a professional dress code for interviews and auditions, setting up a home office, survival jobs, understanding the unions, and the necessity of a realistic BUDGET. It took us three months to create an outline. Our working title was From Soap to Nuts, How to be a WORKING actor. We met with a literary agent who read the outline and the first chapter, sent it to a publisher who had published an autobiography by Helen Hayes and other industry-related books. 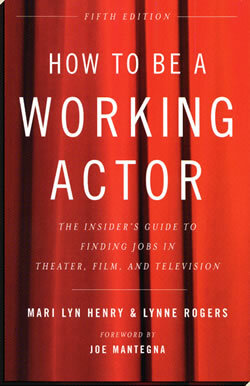 In three days we signed an agreement for the book, with the advice that it should be titled How To Be A Working Actor: The Insider's Guide to Finding Jobs in Theater, Film, and Television. 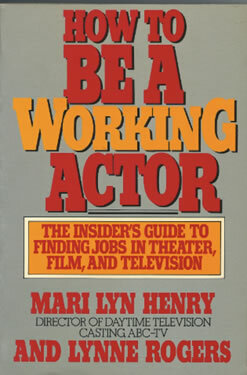 In the fall of 1986, the first edition was published with a blurb on the back cover that read "How To Be A Working Actor offers what amounts to a post-graduate course in the business of acting—a casting director and an actress's practical advice for actors in search of a job." It would be the only edition that had both hard and soft covers. Publisher: M. Evans and Company Inc. 302 pages. Acknowledgments included: Tex Beha, Anthony Call, Sherry Eaker, Catherine Gaffigan, Peggy Hadley, Carmen LaVia, Judith Light, Rita Litton, Marin Mazzie, Mark Redanty, Richard Schmenner, Meg Simon, Mary Jo Slater, Ann Wright. It was the year 1989. Our publisher felt and so did we that updates needed to happen, since a great deal of our information had already become dated. Part One updated the budget items contained in Nuts and Bolts, (what you will need to get started) on both coasts; added new Tools of the Trade, Buyers and Sellers, new ways to Look for Work, Get Your Act Together, additional survival strategies more info on understanding the unions and defining job categories. Part Three: Script Analysis contained new scripts for monologues, soaps, primetime series, film and commercials. One door closes, another one opens. That truism relates to the fact that one day we went to order books from our publisher, to find out that none were available. I had been invited to attend the Southwestern Theatre Conference in South Padre Island, Texas. I ordered 50 books to sign for attendees. To my dismay, I learned that the box had never arrived. I called the publisher's distribution center and learned that the book was out of print. Truth be told, the publisher was going through an economic decline, the royalty checks (which were sent to our agent who took her percentage and we shared the rest) were not arriving on time. A brick did not have to fall on our heads. We wrote 17 book proposals to every publisher from a list of theatre-industry-related books and referrals. This book was a best seller. It was in demand. We received 15 rejections. Two publishing houses wanted to meet us and discuss another edition. When we met with Paul Lukas at Back Stage Books, a division of Watson-Guptill, we were ecstatic. One naysayer had said he thought the book had run its course. Well if you listened to negativity you wouldn't have a career. We learned a huge lesson from this and it is a metaphor for actors who are constantly rejected and then a door opens to employment. Do not give up when you believe in yourself and/or your book. With Back Stage Books behind us, we were able to publish our third edition in 1994. We waited six months to convert the rights from the first publisher and then we set about revising and updating the second edition. There were enormous changes in just five years since the last edition from the amount of money needed to get started to the new material for the script analysis section. In each book there has been an epilogue to inspire and support the actor's journey. In this edition we mentioned "our rapidly, changing, expanding" universe. Before the millennium (imagine anything before the year 2000) we expect you will be able to audition for a job in Turkey or Tahiti without leaving your living room." We always attempted to foresee the future of the business with the help of many knowledgeable industry professionals who were in the midst of vast changes caused by the new technology. While we were rewriting and revising, I had the opportunity to travel to fifteen cities and tape ethnic talent for ABC-TV. In each city, I met some wonderful, serious actors and in Chicago I interviewed Raul Esparza who has made his mark since in Broadway shows and on TV. After he attended NYU and was paying "a fortune for a two-bedroom rathole, he went to Chicago where he didn't have to have a second job, was able to join two unions and had an opportunity to "perform in worthwhile roles at an amazing regional theatre like the Goodman!" Learn your craft and be ready when the door opens! 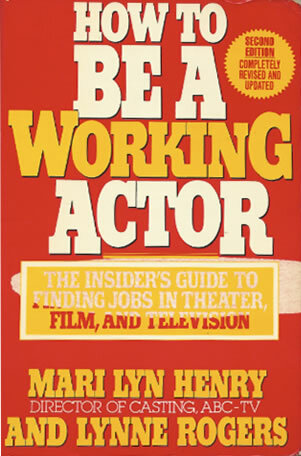 How To Be A Working Actor Third Revised and Enlarged Edition 319 pp. In less than six years we revised and updated all of the chapters and introduced a NEW chapter---- CYBERBIZ. Our regional markets chapter included more cities, there was an appendix about useful Web Sites, and in our budget table, where the money was going included cellphones, web site design, domain name and hosting services. With this edition we were able to enlist the aid of an experienced computer consultant to the industry. What he said resonates with today's readers. "The fact that technology will render the actor obsolete is completely unfounded. Computer generated images may be easier for producers to control than living, breathing actors, but the vibration is simply not the same. And the Web ensures that there will be more channels than ever before imagined for storytellers to share their talents. Artists will have more control and the ability to reach a larger audience than in the past. The peril is data overload—being heard in the din. The solution is to have something to say that people need to hear." 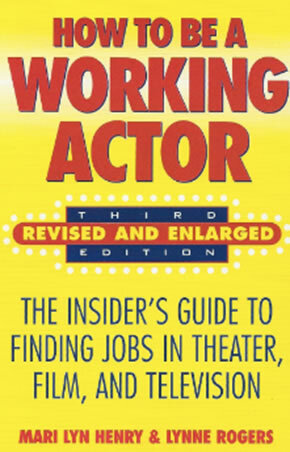 How To Be A Working Actor 4th edition, 2000, Back Stage Books. 367 pp. Since its publication and many mergers and acquisitions, the Back Stage Books list division moved to offices at Random House and became a new part of the Crown Publishing Division. We loved being part of Random House but since then Penguin and Random House partnered to be known as Penguin/Random House and who knows what the future will bring. A few years ago, we learned that we had been published as a Kindle book and that meant we had ARRIVED for a new generation of cyber savvy book readers. The Fifth edition was an intensive labor with almost 70% new information, revised chapters and deleted chapters to streamline the outline. We also spent more time on the impact of the new technology on the actor's career. There were over 100 interviews and exhaustive research thanks to Google who we thanked in our dedication. There were many websites that were no longer available, resources that went out of business, and a new chapter that was vital to the success of actors. TRAINING IS EVERYTHING debuted after we determined that without a foundation of learning the craft, some fledgling careers might never get off the ground. My favorite quote has always been by Mark Twain. "Training is everything. The peach was once a bitter almond; cauliflower is nothing but a cabbage with a college education." We wrote, "Whether you get a B.F.A., opt for a four-year conservatory program, head for the major industry centers after high school graduation, pursue a master's degree, or select your own curriculum of specialized acting classes, you will always be learning and growing during rehearsal, performance and between engagements. Training is everything that helps you prepare for the audition, get the job, and keep it." The Epilogue in this edition is entitled Believe in Yourself inspired by the song from How To Succeed in Business Without Really Trying. The protagonist, J. Pierrepont Finch, totally believed that he had a face that was trustworthy, cool, clear eyes which sought wisdom and truth, blessed with good solid judgment. He possessed what most actors need to embrace: a strong sense of self, an honest arrogance, and determination to beat the odds. Our final message was and is still relevant. Take heart, trust your talent, turn things around, love what you are doing, and go for it. 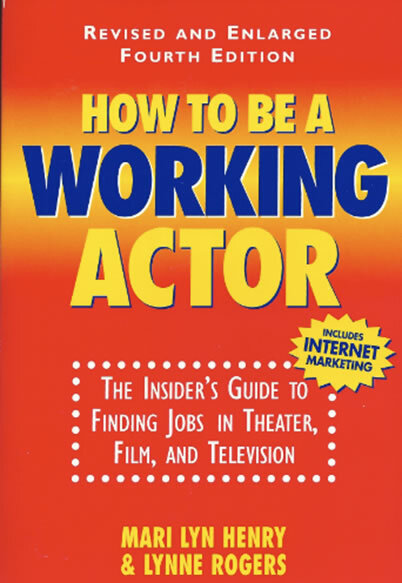 How To Be A Working Actor 5th updated and revised edition. There is no current plan for a 6th edition. The Internet will inform you what websites and other resources are no longer available. Information highways are traveling faster than light and someday all of the information we need will be in one small chip that we can wear on our person or in our glasses. The reality is that what will never change is the heart, mind, and soul of the actor, the thinking, feeling, believing, compassionate, observer of the human condition. In the future, I plan to write a book based on my teaching and knowledge of the business the working title is "Career Intelligence for the Actor of the 21st Century: A common sense approach". (Working Title) STAY TUNED! "Try to remember that wherever you are is where it's at. And don't think you have to be in a particular place. And don't ever give up and don't ever give in."